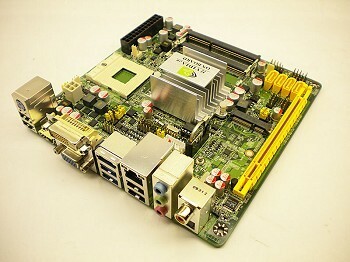 Commell Carte mère Commell LV-674E Mini ITX Motherboard. Support Core 2 Duo/Core Duo/Core Solo CPU with Intel 945G , ICH7R chipset. with Intel GMA 950 Tech VGA,4 x SATA with RAID0/1/5/10, 4 x Giga LAN, USB 2.0, 4 x COM, 7.1 channel Audio, GPIO, SP/DIF, 2 x IEEE1394, IrDA, PCI Express and mini-PCI bus. 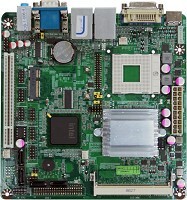 Commell Carte mère Commell LV679 Alim DC 2 x DVI Mini ITX Motherboard. Support Intel Core 2 Duo Mobile processor with 800/533MHz FSB, with Intel GME965 chipset, DDR II up to 3GB, Intel GMA X3100 Graphic, 2 x DVI, 2 x Giga LAN, High Definition Audio, 2 x COM, 8 x USB 2.0, 2 x IEEE1394, 3 x SATA, CF, 2 x mini-PCI and PCI bus, 20-pin ATX power supply or 8 – 30V full range DC Input. 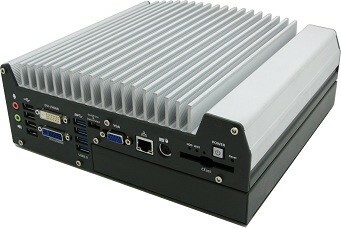 2 x IEEE1394, 3 x SATA, 2 x mini-PCI and PCI bus, 20-pin ATX power supply or 8 – 30V full range DC Input. 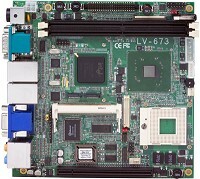 Commell Carte mere Commell LV-673E Mini ITX Motherboard. Support Intel Pentium M/Celeron M processor with 533MHz FSB. 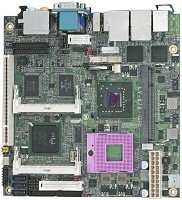 DDR II, with Intel 915GME chipset. with Intel GMA 900 Tech VGA,Dual Giga LAN, USB 2.0, SATA, 4 x COM, Audio, LVDS, PCMCIA,Compact Flash socket, PCI Express and mini-PCI bus. 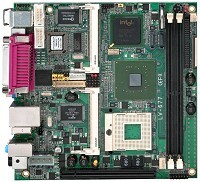 Commell Carte mere Commell LV-677EDC Mini ITX express Motherboard. Support Intel Core 2 Duo/Core Duo/Core Solo CPU with 667MHz FSB, with Intel 945GME chipset, DDR II 533/667MHz up to 4GB, Intel GMA 950 Graphic, LVDS, HDTV, Giga LAN, SATA, High Definition Audio, 2 x COM, 6 x USB 2.0, 1 x IEEE1394, Parallel port, PCI Express and 2 x mini-PCI bus, CF card sockdt, GIOP, DC 9 – 21V used only. 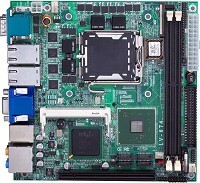 DFI G5G100-P Socket 479, Pentium M / Celeron M, DDR400, Graphics, LVDS, 5.1-channel audio, 2 SATA, Gigabit LAN, 4 COM, 8 USB 2.0, Digital I/O and 1 PCI slot for customized riser card. 1 x DVI , TV-out , 24-bit Dual Channel LVDS . 9V ~ 24V Full range DC input or standard 20-pin ATX power supply . 2 x DVI , TV-out , 24-bit Dual Channel LVDS .